This weeks Economist is a must read for anyone interested in the transition to Electric Vehicles, Battery Technology and Peak oil. The cover and lead article related to the demise of the internal combustion engine or ICE. See Economist. The more detailed briefing (subscription required) covers battery technology in detail and focus of next post. But its days are numbered. 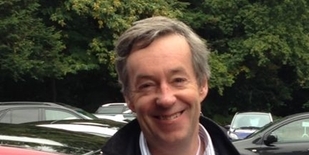 Rapid gains in battery technology favour electric motors instead. The Chevy Bolt has a range of 383km; Tesla fans recently drove a Model S more than 1,000km on a single charge. UBS, a bank, reckons the “total cost of ownership” of an electric car will reach parity with a petrol one next year—albeit at a loss to its manufacturer. It optimistically predicts electric vehicles will make up 14% of global car sales by 2025, up from 1% today. Others have more modest forecasts, but are hurriedly revising them upwards as batteries get cheaper and better—the cost per kilowatt-hour has fallen from $1,000 in 2010 to $130-200 today. 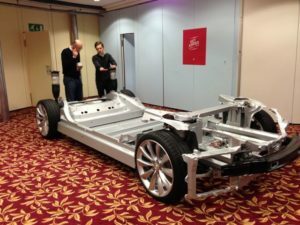 electrification has thrown the car industry into turmoil. Its best brands are founded on their engineering heritage—especially in Germany. 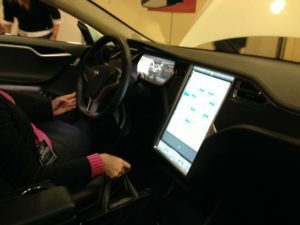 Compared with existing vehicles, electric cars are much simpler and have fewer parts; they are more like computers on wheels. That means they need fewer people to assemble them and fewer subsidiary systems from specialist suppliers. Car workers at factories that do not make electric cars are worried that they could be for the chop. With less to go wrong, the market for maintenance and spare parts will shrink. While today’s carmakers grapple with their costly legacy of old factories and swollen workforces, new entrants will be unencumbered. Premium brands may be able to stand out through styling and handling, but low-margin, mass-market carmakers will have to compete chiefly on cost. Yes we are mentioned in a BBC article published jusst before Christams on the BBC Autos page. Featured as Last-Minute gifts for green-minded drivers. See BBC website. 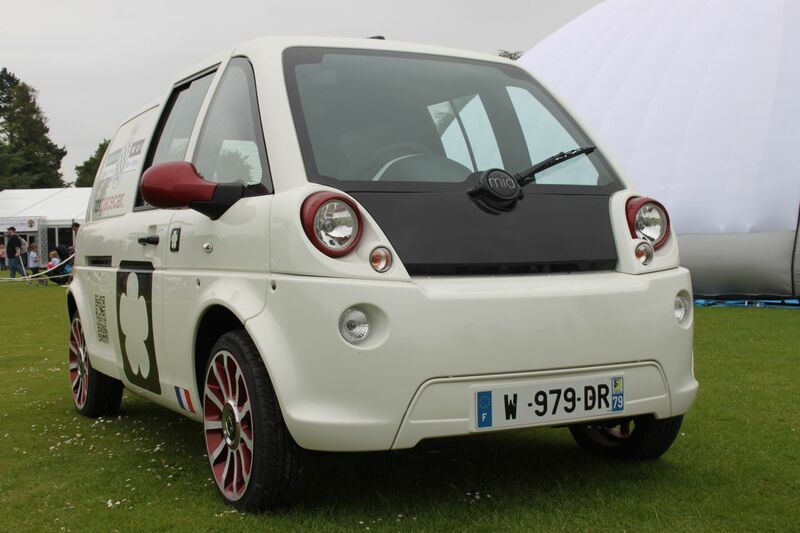 Eco-friendly cars that swap petrol for plugs are becoming increasingly popular. According to the International Energy Agency, in 2015, the number of electric vehicles (EVs) in use across the globe reached over 1.26 million. And 13 million charging stations, which will accommodate that growing number of EVs, are projected to be in place by 2020. The holidays are here, but here are some last-minute ideas for the EV lover in your life, from the cousin who only commutes via e-bicycle, or your friend who refuses to sit behind a steering wheel to spew exhaust into the air. Tip of the hat to Jim Barber for the headsup. Charging an EV like the Nissan Leaf is easy. 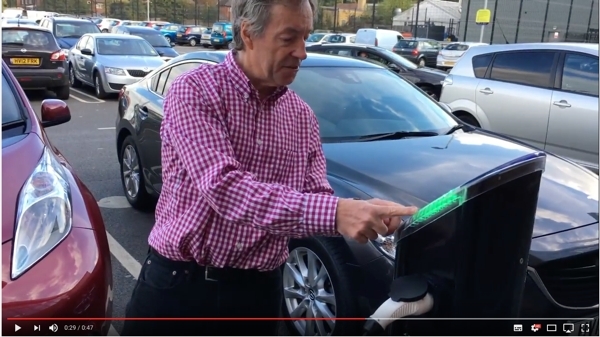 See this short video of plugging a Leaf into a Public Type 2 Charging Post at Sainsbury’s. The Nissan Leaf uses a TYpe 1 on board connection. 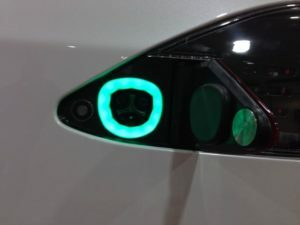 The Pod Point charging system offers a standard Type 2 connection. The cable required is thus a Type 1 – TYpe 2 Charging Cable. This leaf has a standard 16 Amp charger and. This will function with both a 16 Amp or a 32 Amp cable but will only draw 16 Amp from ther supply. In this case we are using a 16 Amp Type 1 – Type 2 cable. EV-CHC007. The UK is one of the last major markets to get the Tesla. I guess it’s because it must be a pain and an engineering cost to switch the car to Right Hand Drive. 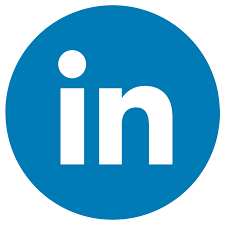 The UK is a large car market and currently the only European market showing any signs of life. The company is now starting to show the Model S. This weekend Tesla held its first public event to drive the Model S on the UK roads. 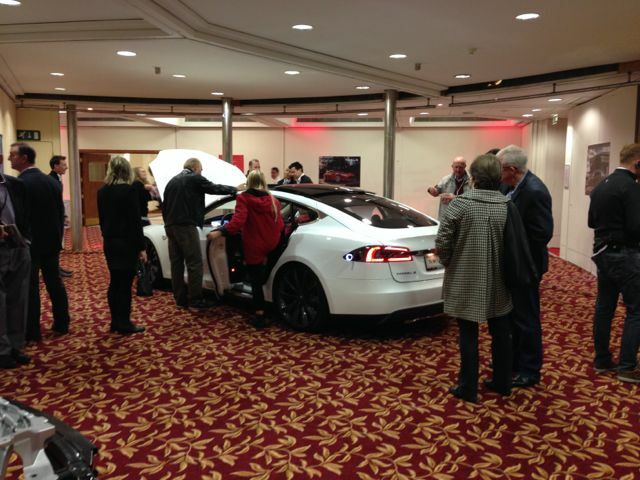 It was an invitation only affair with pre-booked driving slots held at a hotel near Windsor, close to the Tesla UK office. They had 5 Model S cars to drive. All left hand drive and from various part of Europe. 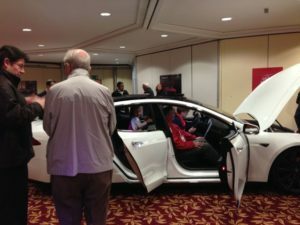 In the hotel room was a rolling chassis and a white car together with a couple of iMacs where you could browse the Tesla site and place an order. 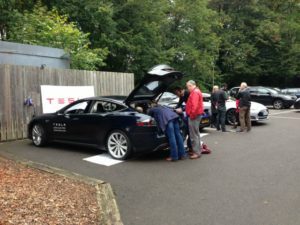 Groups were allocated a two-hour slot to play with the car, speak to the Tesla folk and take a test drive around a set course with an on-board Tesla Co-Pilot. The course was only about 10 miles on length and covered mostly small UK roads with one short stretch on dual carriageway. But before we headed to the road we were subjected to pretty lame presentation about the company and plans. This was a great opportunity to present the company and products. However it was rather dull and poorly presented. An opportunity missed. The car in the hotel room was definitely the center of attention as people climbed in and out of it. 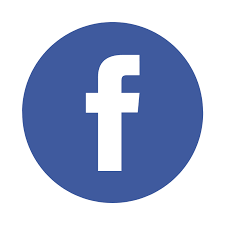 The main comments seemed to be about the size and space. The car is large when compared to most UK cars on the road. 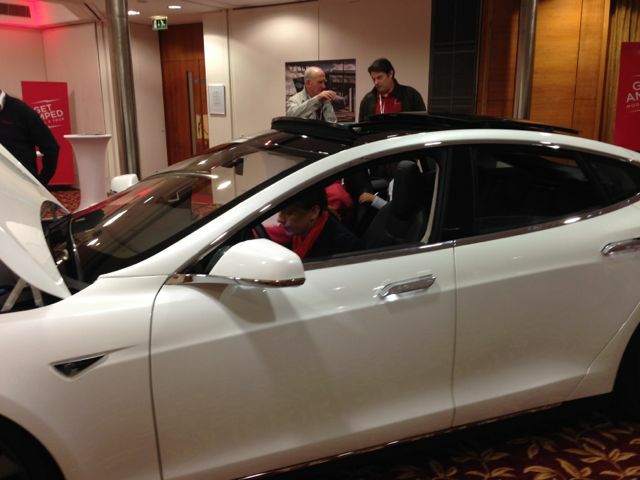 The interior space is massive, especially the rear seats that feel very comfortable and airy. This is backed up the front and rear trunks or as the Brits say bonnet and boot. The brochure claims a storage space of 150 in the front and 1640 in the rear that totals over three times the storage of a BMW 5 Series. The mega control screen was the other key point of interaction. You can do anything with it. All the basics like Sat Nav, radio, climate but also drag the roof open, set the driver’s seat position into memory with a name. The displays for the power usage and range calculations were especially neat and informative. Unlike most hybrids with their graphics showing energy into and out of the pack, the Tessa just showed power used over the last 5, 15 or 30 miles and calculates the expected remaining range based on the most recent driving data. The car drives superbly the ride being especially impressive. Our red car had 21’ wheels fitted with low profile tires. I think the co-pilot said that it was the sportiest of the options. The performance was astonishing, the car just powered away with total ease. We reached no more than 70 MPH and only then for a dozen or so seconds but it reached that speed in a mighty short time. We drove to the event in my Porsche 911 and the Tesla’s performance was far more dramatic than the Porsche. The other big difference was the lack of noise. The car is super quiet and this makes it a relaxing vehicle to drive and be driven in. 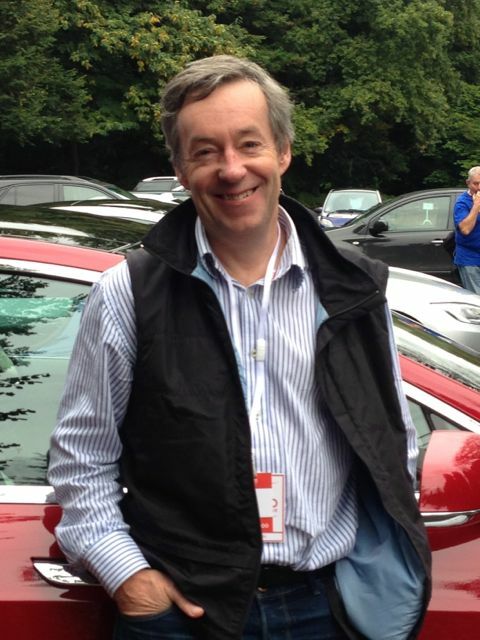 Tesla are now taking orders for UK cars. However the price and specs are not fixed yet. So you can place a £4,000 deposit now and in a few months, most likely early 2014, be told the UK price. Your deposit is fully refundable. 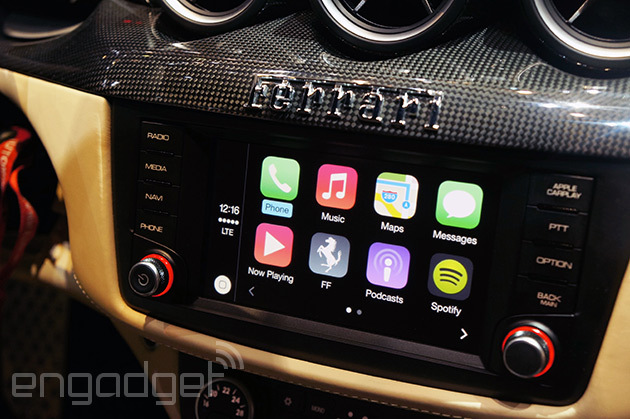 At that point you will be able to configure your car and have a good idea of when it will arrive. People that I spoke with seemed impressed with the car. Not knowing the final price will put some people off from pulling the trigger but we have a pretty good idea of the comparisons from other European countries. One Tesla rep mentioned that they registered 650 Model S in Norway in September and this represented the largest of any model, even the best-selling VW Golf. With petrol and diesel pushing £1.32 per litre, remember that’s equivalent to just under £6.00 per gallon we pay a small fortune for fuel. With a UK average of 10,000 miles per car and say 40 MPG that’s equal to 250 gallons or 1,136 litre of petrol. At today’s price that’s £1,500 just on petrol before you include the road tax and other costs. Of course the big cost in motoring is the depreciation of the car and the finance of the purchase. The running costs are important of course as they have to be met every month. On offer we have a 60Kwh, 85 Kwh and an 85 KWh performance models. All have 8 year battery warranty. 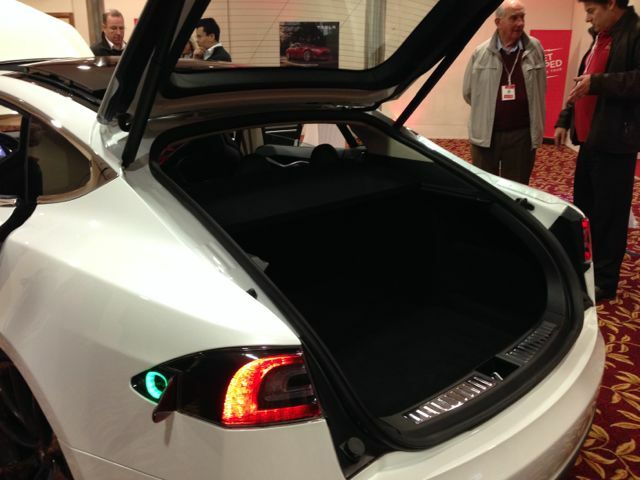 The larger packs offer a 300 mile range and the 65Kwh a 230 mile range. Even the 60 KWh offers impressive performance. The standard specifications on the Tesla are mainly options on the BMW. Heated seats, fancy stereo, tire pressure monitoring, Bluetooth, Climate Control, Keyless entry, Cruise, backup camera and of course 17″ touch screen control system. 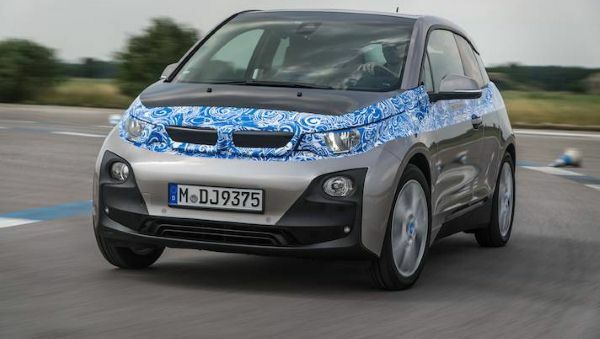 Top Gear hack Paul Horrell reviews a pre-production BMW i3 and likes it. One day, the idea of cars driven by electric motors will become routine. After all, diesels were once a novelty, and so were turbos. We’ve just had a drive in a BMW i3 – visually disguised, but the real thing in the way it behaves – and it feels so incredibly natural that you rapidly fall for the idea that electric drive should be an idea that nobody questions. At first sampling then, this is a compelling electric car. It’s not the first on the market, but BMW has put some original thinking into almost every part of its design and engineering. It drives sweetly, is distinctively designed, and has the reassuring range-extender option if you are anxious about running flat. That said, BMW reckons nearly all i3 buyers will use it as a second car so won’t be doing long journeys, and it’s optimised to make them efficient and fun. Thanks to AutoCAR for playing with and penning a decent review, for once. They enjoy the Tesla S and an Aston Martin Rapide S as a comparison. 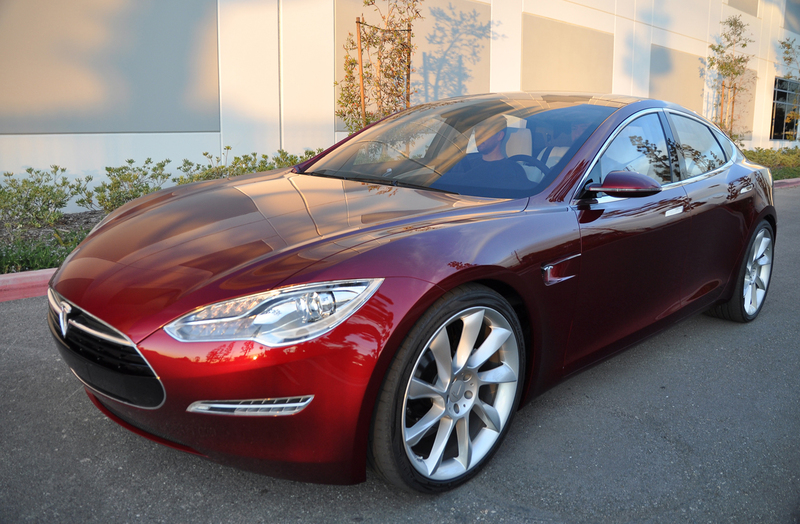 It’s primarily a Model S review. In summary, the reviewer is blown away (his words) and concludes that the Aston seems ‘really, really old fashioned’ in comparison. And, of course, the S easily bests the Rapide in a straight line comparison. Beyond the accolades it’s a nicely produced review and there doesn’t seem to be an agenda. The reviewer also notes that for about the same range, the S costs about £4.5 per charge versus about £120 in fuel for the Rapide. Wow. At the great Goodwood Festival of Speed there is always a Future Tent where the advanced motoring concepts and ideas are to be found. This year was no exception with a number of interesting vehicles, including a pair of MIA cars. Inside the tent was a new 3 seater Mia in white while outside on the Goodwood grass was a Mia van. They looked a little strange next to the concept cars from Toyota and Mazda. However the Mia is real and you can buy one today in the UK. 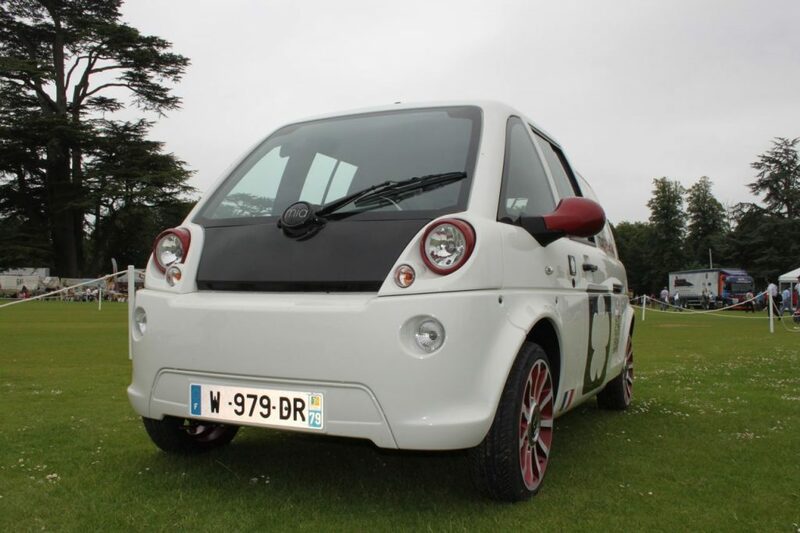 Goodwood had a number of interesting EV vehicles – The GM Volt and Vauxhall Ampere were on display. The most interesting in terms of clever was the Volvo Plug in diesel hybrid. 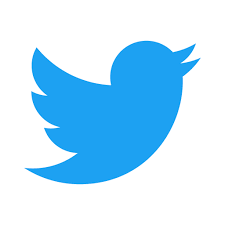 To be reviewed in detail.